Starring the voices of Joseph Kaufmann, Beverly Hope Atkinson, Frank DeKova, Terri Haven, Mary Dean Lauria, Jacqueline Mills, Lillian Adams, Jamie Farr, and Robert Easton. Directed by Ralph Bakshi. 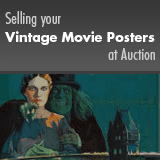 An unrestored poster with bright color and a clean overall appearance. It may have general signs of use, such as slight fold separation and fold wear, edge wear, light creases, or very minor tears. Please see full-color, enlargeable image below for more details. Folded, Very Fine.